Vascular regenerative therapies for the coronary or peripheral vasculature aim to restore pulsatile flow, stimulate neovasculature formation, and enhance vascular function. Stem cells are a promising cell source for vascular repair because of their high replicative capacity and ability to differentiate into vascular cells that incorporate into existing vessels, form neovessels, or release angiogenic factors. Although stem cells can be derived from numerous tissues and have varied differentiation potential, a universal concern is their long term survival in diseased tissues. With the advent of non-invasive techniques such as bioluminescence imaging (BLI), it is now possible to track cell localization and quantify cell survival in vivo. BLI is a highly sensitive technique that has been recently applied towards tracking of cell survival and localization upon stem cell delivery for vascular repair (Table 1). When used in conjunction with assessments of tissue function, BLI can be used to correlate therapeutic efficacy with cell persistence, as well as in identifying optimal cell dosing. In this review, we will describe the application of BLI for tracking transplanted stem cells and associating their viability with therapeutic efficacy, in preclinical disease models of vascular disease. Therapeutic cells for vascular regeneration can be broadly classified as pluripotent stem cells, multipotent stem/progenitor cells, and somatic cells (Fig. 1A). Each class of cells is distinguished based on the expression of known immunophenotypic markers as well as their differentiation potential. Stem cells can be derived from a variety of sources from adult, neonatal, fetal, and embryonic tissues. BLI imaging of therapeutic stem and progenitor cells for vascular regeneration. Application of stem cell therapeutics for bioluminescence imaging. A. Types of therapeutic cells include embryonic stem cells (ESC), bone marrow mesenchymal stem cells (BM-MSC), and primary endothelial cells (EC). B. An example of a viral construct to confer bioluminescence and fluorescence imaging. C. Bioluminescence intensity with increasing cell density. D. Quantification of bioluminescence vs cell density showing linear correlation. Pluripotent stem cells. Among the different types of stem cells, pluripotent stem cells have the greatest differentiation potential as they can give rise to committed cell lineages comprising all three germ layers. Furthermore, pluripotent stem cells have infinite self-renewal capacity. To date there are only two types of known pluripotent stem cells, namely embryonic stem cells (ESCs) and induced pluripotent stem cells (iPSCs). ESCs are derived from the inner cell mass of blastocysts , whereas iPSCs are generated by reprogramming somatic cells by the induced expression of specific transcriptional factors, as first described by Shinya Yamanaka and colleagues in 2006 . Ethical concerns regarding the generation of ESCs from human embryos, and the hurdle of ESC immunocompatibility, have increased enthusiasm for iPSC-based cell therapy. Nevertheless, the clinical application of therapies based on ESCs is farther along in development than those using iPSCs. Geron was the first company to gain FDA approval for a clinical trial using human ESC-derived oligodendrocytes for spinal cord repair . More recently, Advanced Cell Technologies has received FDA approval for clinical trials using human ESC-derived lineages for treatment of Stargardt disease and age-related macular regeneration, and other companies are nearing submission for IND approval, such as Viacyte with a product for type 1 diabetes . Since iPSCs can be derived from a variety of tissues and have high replicative capacity, they are potentially an unlimited source of autologous therapeutic cells. Already, pre-clinical studies using iPSC-derived cells have shown promise for treatment of sickle cell anemia, Parkinson's disease, beta-thalassemia, and peripheral arterial disease (PAD) [5-7]. However, some concerns have been raised regarding the chromosomal and point mutations, and incomplete transgene silencing, that could lead to oncogenic potential, as well as functional differences compared by comparison to ESCs [8-12]. These concerns have been addressed in part by more recent studies indicating that these genetic and epigenetic abnormalities may be obviated with careful generation, culture and selection of iPSCs . Although pluripotent stem cells themselves are capable of forming teratomas in vivo, once they are differentiated into lineage committed cell fates, it is likely that the differentiated progeny will maintain their phenotype in vivo. Multipotent stem cells. Multipotent stem and progenitor cells and can be derived from a variety of adult and fetal sources, including bone marrow, adipose tissue, muscle, lung, and pancreas . Multipotent stem cells are identified based on their expression of multiple cell surface glycoproteins, as no one antigen is sufficient. Furthermore, differences in tissue origin also affect their phenotypic markers, as bone marrow-derived mesenchymal stem cells (MSCs) have slightly different surface marker expression when compared to adipose-derived stem cells (ASCs) . Unlike pluripotent stem cells, multipotent stem cells have limited self-renewal capacity and can only give rise to limited types of committed progeny. For example, hematopoietic stem cells give rise to all blood lineages of the bone marrow. Since multipotent stem cells can be harvested autologously, and because their application has lower regulatory hurdles, clinical trials of multipotent stem cells are furthest advanced in comparison to iPSC or ESC based therapies. In most clinical trials of multipotent adult stem cells, the cells are simply harvested and administered directly into the diseased tissue, where it is assumed that in-vivo cues can direct their cellular responses, lineage specification, and incorporation into the tissue. Besides stem and progenitor cells, somatic cells such as primary endothelial cells have been demonstrated to enhance blood flow and angiogenesis in ischemic tissues, in part by incorporating into existing vasculature and forming neovessels [16, 17]. However, patients with cardiovascular diseases may have dysfunctional endothelial cells, which limit the therapeutic efficacy of cell transplantation. Another approach may be to transdifferentiate a somatic cell (eg. a fibroblast) into an endothelial cell. Although transdifferentiation to generate vascular cells has not yet been reported, transdifferentiation of fibroblasts into neurons, or into cardiomyoblasts, has been achieved [18, 19]. Clinical trials using stem cells in patients with PAD and coronary heart disease to augment vascular regeneration have been limited to adult human bone marrow mononuclear cells, MSCs, or endothelial progenitor cells. These stem cells have shown some promise of therapeutic benefit. In patients with PAD, small clinical trials using adult stem cells (usually bone marrow derived mononuclear cells) have shown modest improvements in limb hemodynamics, wound healing, and/or functional capacity (usually assessed by treadmill walking time) [20, 21]. Proposed mechanisms of benefit include the secretion of angiogenic cytokines, differentiation into vascular lineage, cell fusion, and/or incorporation into the existing tissue to improve tissue function [21, 22]. Larger randomized clinical trials are needed to confirm the benefit and to address mechanisms. However, since adult stem cells such as endothelial progenitor cells are reduced in number and impaired in patients with cardiovascular risk factors [23, 24], alternative therapeutic cell sources such as iPSCs are promising, especially in light of recent developments in the non-DNA-based generation of iPSCs . Although data from clinical trials provide promise for stem cell therapy, the optimal cell type, cell dosing, and route of administration is still unknown. Therefore, non-invasive cell tracking methods such as BLI provide added information regarding cell survival and localization to facilitate an understanding of any benefit, and to optimize treatment. We now discuss the principle of BLI and its application in preclinical studies of stem cell delivery. Application of imaging modalities to elucidate the fate of stem cells after in vivo transplantation for vascular disease is at an early stage. Recently, BLI has been applied for tracking the localization and survival of stem and progenitor cells in vivo for vascular regeneration. This approach involves genetically modifying the therapeutic cells to confer expression of a bioluminescent reporter enzyme, most commonly firefly luciferase (fluc) (Fig 1B). When fluc binds its substrate, D-luciferin, an oxidation reaction occurs resulting in the emission of photons with peak intensity near 560 nm . The bioluminescence intensity correlates directly with cell density, and this relationship allows for relative quantification of cell numbers in vivo and in vitro (Fig. 1C-D). A recent modified version of the fluc gene, known as luc2, provides improved photon emission and greater sensitivity, even capable of non-invasively detecting single cells in vivo . In addition to fluc, a variety of luciferases derived from other organisms have been optimized to display unique spectral properties upon excitation. Though fluc remains the preferred enzyme for BLI due to the high intensity of light it produces, the availability of multiple luciferases allows for the simultaneous monitoring of numerous biological processes when the appropriate filter and substrate combinations are applied . Two particular luciferases under development are Renilla and Gaussia. Although their smaller size and ATP-independent excitation are advantageous over fluc, their substrate, coelenterazine is rapidly metabolized and limited in biodistribution capabilities when compared to luciferin [29, 30]. These enzymes produce blue light with peak emission near 480 nm . Light at this wavelength is more susceptible to tissue scattering and background signal. However, red-shifted variants of Renilla have less endogenous background signal and may have enhanced utility in small-animal imaging . The primary advantage of BLI over other imaging modalities is its high detection sensitivity and low background signal. Unlike fluorescence imaging, BLI does not require external illumination of the tissue. As a result, photon emission from endogenous particles is reduced. This high signal-to-noise ratio enables the reliable detection of quantities as low as single transplanted cells at specific anatomical sites, when using luc2 . In addition to superior sensitivity and specificity, the non-invasive nature of BLI allows for quantitative assessment of viable cell numbers in living organisms that can be carried out cost-effectively over multiple time points. This feature provides a great advantage over traditional histological evaluation of transplanted cells that requires euthanasia of animal subjects. For example, when implanted within the ischemic hindlimb with biocompatible matrix proteins, we could non-invasively monitor the survival of human iPSC-derived endothelial cells (Fig. 2A) for at least 14 days (Fig. 2B). One limitation of BLI is attenuation and scattering of light by tissues. For each centimeter of tissue, hemoglobin, as well as other endogenous molecules, may reduce optical signals by a factor of 10 . As a result, sources that are nearer to the surface of the subject appear to have brighter signals in comparison to more internal sources. Additionally, because the images generated by BLI are two-dimensional, signals from overlapping anatomic structures are summated and cannot be quantified individually. However, technological advances in optical imaging over the past decade are beginning to address these issues. Three-dimensional diffuse tomographic reconstructions, which can be obtained using fluorescence molecular tomography, allow for both molecular and structural data to be gathered simultaneously . Moreover, the sensitivity and resolution of BLI images has improved dramatically with the advent of highly sensitive charge-couples device detectors, specialized filters, and enhanced spectral analysis techniques . Although these advances enable BLI to serve as a powerful tool for the investigation of biological processes and the development of cell-based therapies in preclinical models, the present risks associated with genetically modifying cells to express a bioluminescent reporter preclude the use of BLI in human subjects at this time, The development of DNA-free methods of inducing luciferase expression, including modified mRNA  or protein  approaches, may allow for the expansion of BLI into clinical experimentation although the current limitations of tissue penetration in large animals and humans will need to be overcome. . Adult stem and progenitor cells. BLI has already played a critical role in assessing cell localization and survival in preclinical studies of adult stem and progenitor cell-based therapies for vascular disease. An early study assessed the in vivo longevity of human CD34+ progenitor cells derived from peripheral blood when injected into the peri-infarct region of infarcted murine myocardium. The cells were stably transduced with a triple fusion construct containing fluc, enhanced green fluorescent protein (eGFP), and human herpes simplex virus type 1-thymidine kinase (HSV1-tk) to enable multi-modal imaging by BLI, fluorescence microscopy, and positron emission tomography (PET), respectively . BLI tracking revealed an increase in cell numbers in the infarct scar over the course of the first 2 weeks, followed by a gradual decline in cell numbers for the next 50 weeks. Notably, cell signal persisted for up to 52 weeks, based on BLI, and the localization of cells in the scar was further verified by PET imaging. Ejection fraction was significantly improved by CD34+ cell therapy as early as one week after injection, and the improvement could be sustained for up to 52 weeks, when compared to sham-operated mice. The mechanism of action appeared to be due to angiogenesis and/or paracrine factors, since in vivo delivery of vascular endothelial growth factor (VEGF) antibody blocked the improvement in cardiac function after cell therapy. In a murine model of PAD, the femoral artery of mice was ligated to induce hindlimb ischemia, and BLI was used to assess the effect of bone marrow-derived MSCs on vascular perfusion . Derived from transgenic mice expressing GFP and fluc, MSCs or fibroblasts were injected into the ischemic limbs of syngeneic mice. Longitudinal monitoring of cell survival using BLI demonstrated that MSCs persisted for up to 6 days, whereas half of the injected fibroblast remained after 22 days. Despite their short-term survival, MSCs improved capillary density and reduced ischemic muscle damage, when compared to the groups receiving fibroblasts or saline. However, the MSCs did not appear to differentiate into vascular lineages, based on the absence of colocalized GFP expression with endothelial markers. The mechanism of improvement may be in part due to the ability of MSCs to secrete higher levels of VEGF under hypoxic conditions than under normoxic conditions, whereas fibroblasts manifested reduced secretion of VEGF under hypoxia. Transduction and in vivo delivery of human induced pluripotent stem cell-derived endothelial cells (iPSC-ECs). A. Purifed iPSC-ECs were transduced with a fusion reporter construct encoding fluc and GFP. Immunofluorescence staining demonstrates about 30% positive expressing GFP while coexpressing endothelial phenotypic marker, VE-cadherin. B. When delivered into the ischemic hindlimb with biocompatible matrix proteins, the cells could be tracked using BLI for at least 14 days. In a study by Laurila et al, BLI was utilized to observe the engraftment of transplanted stem cells into ischemic hindlimb tissue . 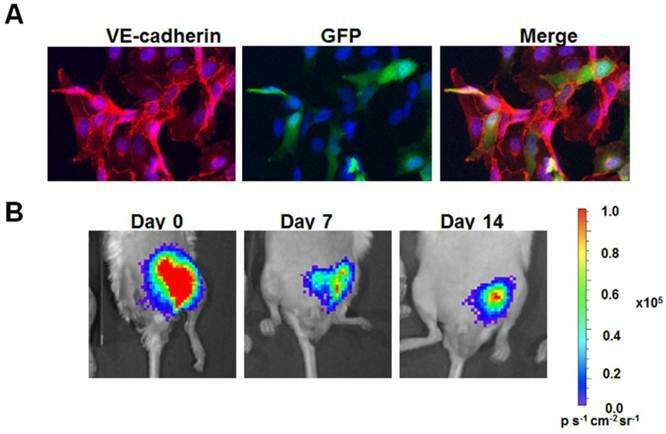 Human ESC-derived MSCs or adult human bone marrow-derived MSCs were locally transplanted into a rat hindlimb ischemia model. The ESC-derived MSCs were genetically engineered to express GFP and luciferase. Using BLI, it was determined that only about 1% of transplanted MSCs persisted for 3 days after delivery. Whole body imaging revealed no bioluminescence signal in any other tissues than at the site of injection, confirming no migration of transplanted cells. Despite limited engraftment, the ESC- or BM-derived MSCs increased angiogenesis and skeletal muscle cell proliferation after 3 days. At later time points, there was no significant difference in these endpoints by comparison to the control ischemic animals. The authors concluded that the short-term benefits in angiogenesis and proliferation were due to the activation of endogenous signaling pathways rather than human cells. In immunocompromised mice, enhanced BLI was used to study the effects of human bone marrow-derived MSCs on the survival of human endothelial cells . In comparison to matrigel plugs containing endothelial cells alone, mixtures of MSCs with endothelial cells had higher BLI signal intensity after 120 days, as well as a greater number of functional neovessels that contained blood cells. Histological analysis revealed that the neovessels in the coculture group had greater numbers of vessels lined by human endothelial cells, when compared to the plugs containing human endothelial cells alone. Adipose tissue is another promising source of therapeutic cells for vascular repair. Bai et al. compared the therapeutic efficacy and survival of freshly isolated human adipose tissue-derived cells in contrast to cultured ASCs, in a SCID mouse model of myocardial infarction . Cultured ASCs were homogeneous in their expression of stromal stem cell phenotypic markers, whereas freshly isolated human adipose tissue-derived cells appeared to be a heterogeneous population containing CD44+ stromal stem cells, as well cells staining for CD34 (46%), CD31 (10%), and smooth muscle α-actin (4%). When injected into the peri-infarct region, either freshly isolated human adipose tissue-derived cells or cultured ASCs improved cardiac function as assessed by ejection fraction and end systolic volume after 4 weeks, in association with increased vascular density and reduced apoptosis in the myocardium. To assess the in vivo survival of ASCs in the ischemic myocardium, the cells were lentivirally transduced with a double fusion construct encoding for GFP and fluc under the control of a long-terminal-repeat promoter. Temporal profiling using BLI demonstrated that cell survival initially decreased over the course of 2 weeks, followed by a gradual increase in cell density. At 16 weeks following implantation the human adipose tissue-derived cells were localized only to the heart, as imaging of other organs such as the lung, liver, and spleen did not show detectable bioluminescent signal. This work highlights the utility of BLI in monitoring cell survival, and in providing insights into the efficacy of human adipose tissue-derived cells or cultured ASCs in this model. In a related study by Bai et al. , the authors reported that human ASCs secreted angiogenic growth factors, basic fibroblast growth factor (bFGF), and insulin-like growth factor-1 in the ischemic myocardium. It is likely that the enhancement of myocardial function following administration of ASCs was attributable to paracrine effects, rather than incorporation of the cells into the ischemic tissue. Pluripotent stem cells. Pluripotent stem cell-derived lineages are an attractive form of cell therapy because of their unlimited self-renewal capacity. Both ESC-derived and iPSC-derived ECs may persist in, and enhance neovascularization of, the ischemic limb or myocardial tissue. We have previously used BLI and laser Doppler spectroscopy to study the effect of syngeneic ESC-ECs in a murine hindlimb ischemia model . ESC-derived ECs enhanced perfusion when delivered by intra-arterial and intravenous delivery, but not by intramuscular injection, as compared to saline-treated animals. Concurrent with the intra-arterial or intramuscular administration of ESC-EC, a BLI signal was observed in the ischemic limb that decayed over time. When cells were delivered intravenously the cells initially lodged in the lung region, as detected by BLI. Intriguingly, over a period of several days, the BLI signal disappeared from the lung, and began to increase in the ischemic (but not the contralateral unoperated) hindlimb. This observation suggested that the ESC-ECs initially trapped in the lung were able to home to the ischemic limb. Unlike ESCs, the ESC-ECs could not be detected in spleen, lung, and liver tissue samples at 2 weeks after cell delivery. A significant improvement in blood perfusion was observed with both intra-arterial and intravenous administration of the cells. The beneficial effect of cells administered intravenously was delayed by comparison to intra-arterial administration, and was temporally concordant with their homing to the ischemic hindlimb. The observations are most likely explained by a paracrine angiogenic effect of the cells after they become localized to the ischemic limb. Of note, parental ESCs did not home to the ischemic limb when injected intravenously, nor did they improve perfusion when administered by any route. We recently used BLI to optimize an intramuscular delivery strategy using human fluc-expressing iPSC-derived ECs for treatment of hindlimb ischemia in SCID mice . The cells were delivered in two doses on days 0 and 7 after the induction of hindlimb ischemia. Based on BLI, there was a gradual decrease in cell viability over the course of the first 7 days. Accordingly, we modified the delivery strategy so as to provide a second injection of cells on day 7. Over the course of the following week the BLI signal declined gradually, indicating some loss of cells over time. Nevertheless, the repeated injection of iPSC-derived ECs modestly enhanced limb perfusion, as corroborated by capillary density analysis. Although rare iPSC-ECs were observed to incorporate into existing vessels, it is likely that the enhanced perfusion was largely due to a paracrine effect, as the iPSC-ECs could generate angiogenic factors in response to hypoxia. 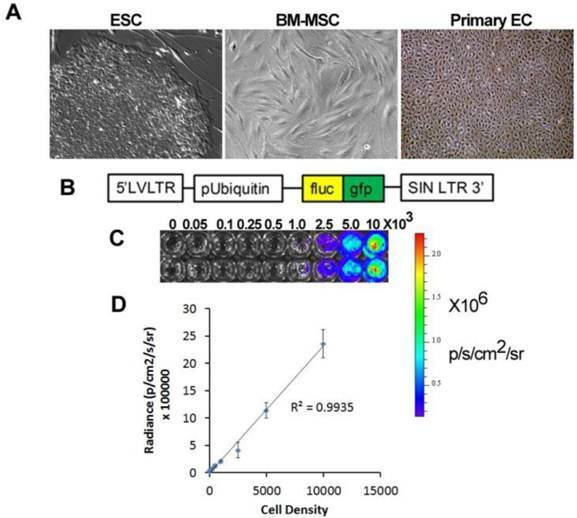 BLI has also been utilized to quantify the viability of ESC-derived cells injected into the peri-infarct region after experimental myocardial infarction. When murine ESC-derived ECs were injected into the ischemic myocardium of syngeneic mice, the cell survival decreased most sharply within one week, with only ~1% of the signal remaining after 8 weeks, when normalized to the signal intensity of day 2 . Although few remaining ESC-derived ECs could be identified histologically in native vessels, there was significant improvement in capillary density, concomitant with higher fractional shortening and ejection fraction as measures of cardiac function after 8 weeks. In contrast to ESC-derived ECs, ESCs showed marked differences in cell survival and cardiac function when injected into ischemic scars. There was a transient decrease in cell viability for the first week, followed by a robust proliferation for up to 3 weeks, based on BLI. The increase in BLI signal was consistent with the formation of teratomas resembling cells of all three germ layers. Unlike ESC-derived ECs, ESCs did not improve cardiac function. Similar to murine ESC-derived ECs, human ESC-derived ECs also manifested poor survival when injected into the peri-infarct region of SCID mice . Based on BLI, human ESC-derived ECs declined in cell number most rapidly during the first week, resulting in about 6% survival after one week and 1% after 8 weeks, when normalized to cell numbers after 2 days. The loss of transplanted cells could in part explain the minimal effect of the cells on microvascular density. Based on immunofluorescence staining of histological sections, some of the remaining ESC-derived ECs localized in the host vessels. Unlike the long-term efficacy of murine ESC-derived ECs, human ESC-derived ECs appeared to improve cardiac function based on quantification of fractional shortening after 2 weeks, but the therapeutic benefit was lost after 8 weeks. These results suggest that human ESC-derived ECs injected into the ischemic murine myocardium do not incorporate well into the host vasculature and have a minimal and transient effect on cardiac function. One approach to further enhance the angiogenic capacity and survival of ESC-derived ECs is to stimulate them with a trophic small molecule or growth factor at the time of administration. Stimulation of the EC nicotinic acetylcholine receptor previously has been shown to stimulate endothelial proliferation and tube-like formation in vitro and to enhance angiogenesis and ischemic limb perfusion in vivo . At physiological concentrations, nicotine could activate nicotinic acetylcholine receptors in human ESC-derived ECs and promote cell survival and proliferation in vitro . When physiological concentrations of nicotine were then introduced into the drinking water of SCID mice after injection of human ESC-derived ECs into the infarct scar, cell survival was significantly improved for up to 6 weeks when compared to animals treated with cells in the absence of nicotine. Furthermore, activation of nicotinic acetylcholine receptors stimulated angiogenesis, as quantified by significantly higher microvascular density. The enhancement in neovascularization was partly due to upregulation of bFGF and VEGF gene expression and by phosphorylation of MAPK and Akt. Stem cells are a promising reagent for vascular repair, but many obstacles need to be overcome before they can be widely used clinically. As illustrated by BLI and other non-invasive imaging techniques, cell viability of transplanted cells in ischemic tissues remains major concern. Although the aforementioned studies suggest that the cells can exert a therapeutic effect even without prolonged survival, strategies to enhance viability using survival factors (ie HIF1α, Akt, bcl2) may provide additional benefit. Furthermore, the addition of soluble factors and three-dimensional extracellular matrices may further promote cell survival and/or angiogenesis. With respect to the in vivo safety of stem cells, there are additional cautions in the use of cells derived from pluripotent stem cells. Therefore, new strategies for non-integrative induction of pluripotentiality, enhanced culture conditions using xeno-free reagents, and improved measures of depleting the therapeutic cells of any pluripotent stem cells will improve the safety of these cells. For example, a recent study demonstrates that cell surface marker anti-stage-specific embryonic antigen (SSEA)-5, which binds to H type-1 glycans, could efficiently deplete a mixed cell population of pluripotent cells . In the development of new stem cell-based therapies, BLI or other non-invasive imaging approaches will become increasingly important in providing cell survival information in pre-clinical models. With a greater understanding of stem cell generation, purification, and the mechanism of therapeutic involvement, stem cell-based therapeutics will ultimately be realized. This study was supported by grants to JPC from National Institutes of Health (U01HL10039, RC2HL103400,1K12HL087746). NFH was supported by a grant from the National Institutes of Health (HL098688).